The Trump administration and the May government in the UK seem poised to launch missile strikes on Syria in the near future. It probably won’t matter. The Syrian regime figures it can take the punishment, which is likely to consist of another set of one-off missile strikes similar to those launched on the Shuayrat Base in spring of 2017 after a chemical weapons attack by the regime in Khan Sheykhoun. Syrian and Iranian troops are said to be quietly deserting major air force bases, temporarily relocating outside them, in anticipation of the strikes. The Syrian regime has all but won the civil war. It has all the major cities–Damascus, Aleppo, Latakia, Homs, and even Hama. It controls what the French colonialists used to call “useful Syria,” the band of fertile land stretching from Damascus to the north in the west of the country. While it has lost the ten percent of the population that is Kurds in the northeast, the Syrian Kurds are not regime enemies and likely will be forced into an alliance with Damascus over time in the face of attacks by Turkey and by fundamentalist Arab militias backed by Turkey. ISIL has been largely defeated as a territorial force, though it holds out in some small pockets in the east. There were three remaining significant enclaves of resistance to the regime in Arab Syria. They were Idlib (a province in the northwest) and the area north of Aleppo; East Ghouta, a set of suburbs of Damascus of some 350,000 inhabitants just east of the capital; and the far south and southwest of the country (Deraa and the Golan Heights). There are a few other minor rebel outposts, for instance in the Qalamoun mountains on the Lebanese border or outside Hama. They are not militarily important and more an annoyance for the regime than anything else. Although Russia has offered the rebels “de-escalation zones,” a sort of temporary cease-fire, these turn out to be a way to nurse regime strength while preparing for further assaults on the rebels. East Ghouta was such a zone. The government of Bashar al-Assad maintains that Damascus took regular mortar fire from the Salafi Jihadi militias that had come to control the three major districts of East Ghouta. In any case, during the past two months the Syrian Arab Army, with air support from the Russian Aerospace Forces, began a brutal battle of conquest against East Ghouta. Two the the districts and their guerrillas surrendered, agreeing to go north to Idlib. 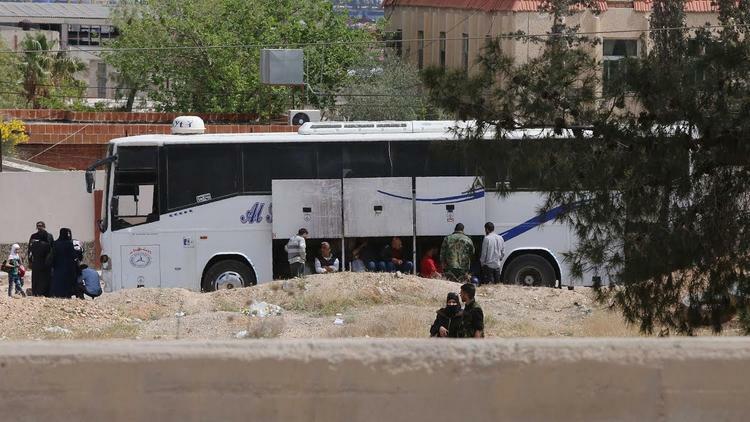 About half the population of East Ghouta appears by now to have gone with them. The third district, Douma, was dominated by the Saudi Arabian proxy, the Army of Islam. It had a problem with going to Idlib since it is at war not only with the regime but with the other hard line Salafi guerrillas who dominate that northern province, especially the Levantine Liberation Council (HTS), the core of which is the old Nusra Front with its ties to al-Qaeda and 9/11 mastermind Ayman al-Zawahiri. The Army of Islam was inflicting substantial casualties on the elite Panther Brigade (Syrian Arab Army special operations forces) who led the invasion of Douma last week. The Army of Islam refused to surrender and said they wanted to work out a deal to remain in Douma. This was a non-starter for Bashar al-Assad, who wanted all the rebel bases near the capital completely gone. But my hypothesis is that he could not risk losing more troops from the crack Panther Brigades. So he decided to send down a barrel bomb of mixed chlorine and sarin gas on Douma. Perhaps he just meant to kill a dozen or two dozen Army of Islam fighters. Instead, the gas killed around 70 people, including mostly civilians and some children, and the relief workers in the enclave got video and blew the whistle on the regime. Al-Assad brazenly committed a war crime, confident that the Russian Federation would protect him from its consequences. While the focus of the Western press has been on the response from Trump, who considers chemical use a red line that requires a US military response, it has been little noted that al-Assad’s ploy worked. The Army of Islam leaders abruptly surrendered, perhaps under severe pressure from Douma’s terrified civilian population, who did not want to be further gassed so that the Saudi-backed Salafis could go on trying to save face. Late Wednesday, a Russian spokesman at Latakia announced that as they departed Douma, the 8,000 Army of Islam fighters surrendered four hundred pieces of military equipment, light and heavy. Some 41,000 people have left Douma this spring through Russian checkpoints, 12,000 of them in April alone. They seem to be heading not to Idlib but to Jarabulus in the Aleppo governorate near the Turkish border and there are some reports of Turkey settling them in Afrin as part of its ethnic cleansing campaign against leftist Kurds there. Adding insult to injury, Ali Akbbar Velayati, the special adviser to Iran’s clerical Leader Ali Khamenei, made a tour of east Ghouta on Wednesday! Saudi Crown prince Mohammed bin Salman must have been doing a slow burn to see Velayeti strutting around territory that had once been a promising base for the takeover of Damascus and from which Saudi strategists had planned bombings of regime facilities in the capital. Velayati covered himself and Khamenei in indelible shame, however, inasmuch as he implicitly gave his imprimatur to the gas attack that had sealed the regime victory. Iran suffered mustard gas attacks at the hands of Saddam Hussein in the Iran-Iraq War of 1980-1988, and had previously taken a principled stance against the use of chemical warfare. Velayati said that the upcoming US strike on Syria would offer no hope to the defeated rebels. In that pronouncement, at least, he likely is right. And it reveals Syrian, Russian and Iranian thinking. The war aim has been achieved and the lives of Syrian special operations forces (who are limited in number) were preserved. The little kids with white foam around their mouths, eyes staring lifelessly, were collateral damage.